One of the most popular energy sources for Canada and globally has been hydroelectric power generation, and the provinces of Ontario, Quebec, Manitoba, and British Columbia are big fans of this particular energy source. One of the main reasons it is so popular is due to the abundance of water in Canada in the form of lakes and rivers that run throughout the provinces. There was an article by the Montreal Gazette written back in 2011 that took a look at the Romaine River in Quebec and how it was about to turn into one of the biggest construction sites in Canada with the installation of 4 dams, 7 dikes, several large canals, and 279 square kilometers of reservoirs, all at the approximate cost of around $8 billion. What decision makers in Quebec failed to realize or choose to ignore is that harmful greenhouse gas (GHG) emissions are generated by reservoirs and they can be extensive and very damaging to the climate. The Canadian Hydropower Association states that hydropower, which is “Canada’s number one electricity source is clean and renewable” (Canadian Hydropower Association, 2016). 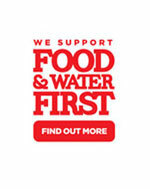 The website goes on to say that “Hydropower produces no air pollutants and has ultra-low GHG emissions”. This is what is so fascinating about their choice of words, it is true that the turbines may not produce any air pollutants because by definition they produce hydroelectricity, therefore no actual air pollutants are being emitted. However, the website states that hydropower has low emissions, which in fact is a false statement. Most hydroelectric facilities rely on reservoirs to produce power during peak demand, and reservoirs do produce harmful GHG emissions – in fact quite a lot. There are several peer reviewed studies which indicate that emissions from dams are much higher than politicians are letting on. Below are some examples of studies conducted within Canada and around the world. An article by (Li & Zhang, 2014) looked into how much carbon emission actually is released from hydroelectric reservoirs. One important thing it points out is that these emissions from rivers and dams are not included in the global carbon budget due to some uncertainty. According to the article, approximately 301.3 Tg of CO2, and around 18.7 Tg of CH4 is released annually by hydroelectric reservoirs, globally. Keep in mind that 1 Tg equals approximately 1 million metric tons, so you can see that it is a major contributor to the global carbon budget. 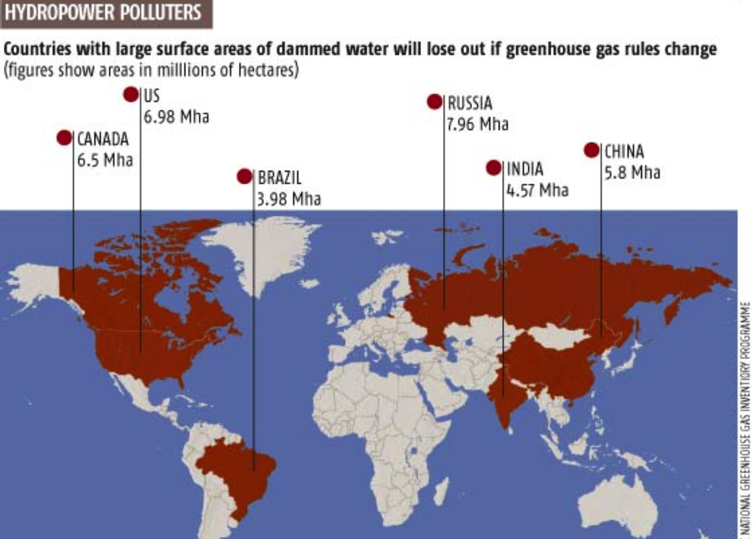 There was another article written back in 2011 by (Demarty & Bastien, 2011) which perfectly summed up the amount of GHG emissions that are being released from these hydroelectric reservoirs, not just here in Canada but around the world. An extremely interesting part of their emission research was that they focused on Methane (CH4) because it is more potent and has a much higher GHG emission potential when compared to other GHG’s; therefore, even a smaller quantity can have a devastating effect on our climate. Finally, when looking into the uncertainty aspect of emissions from hydroelectric reservoirs, an article by (Li & Lu, 2012) reported that carbon emissions have been largely underestimated. The study explores what kind of uncertainties scientists are currently facing when it comes to estimating carbon emissions. Firstly, the global reservoir area varies from 0.26 to 1.5 million km2, this of course will have an impact in modeling and estimating potential carbon emission from these reservoirs therefore better modeling is required. Secondly, countries such as China and India are installing hydroelectric dams at an increasing rate; however, current or potential emission data is pretty much non-existent from these dams. Countries in North America and Northern Europe have at least begun to estimate carbon and that is a positive sign even though more research is required. Finally, the last uncertainty and arguably one of the biggest unknowns is the relation of carbon emission from hydroelectric reservoirs to the actual age of the reservoir itself. Better research is required to understand the different ecological zones that are currently being occupied by these dams. Emissions from reservoirs usually occur as a result of decomposition of organic materials, as well as sediment trapped behind the dam; however, the article states that emissions could remain at higher levels for many years, and are projected to be higher in drawdown areas. Drawdown in civil engineering means the lowering of water in a man-made reservoir or dam, and often used in small hydro reservoirs to maximize power production for peak demand. There is a disconnect between what industry and governments are telling us, and what research has shown – that GHG emissions from these hydroelectric reservoirs are much higher than we have been led to believe. One can only speculate as to the reason for this disconnect. Canada is already very invested in hydroelectric power generation, and that could be the reason they choose to ignore the amount of GHGs emitted from reservoirs, and the reason for limiting the funding available for scientists to conduct research. Limiting research could have devastating effects on our global carbon budget in a time where our focus is to reduce our emissions. Canada being a country that relies so heavily on hydroelectricity may be making a mistake by not researching the dark side of it. Demarty, M., & Bastien, J. (2011). GHG emissions from hydroelectric reservoirs in tropical and equatorial regions: Review of 20 years of CH4 emission measurements. Energy Policy, 4197-4206. Li, S., & Lu, X. X. (2012). Uncertainties of carbon emission from hydroelectric reservoirs. Natural Hazards, 1343-1345. Li, S., & Zhang, Q. (2014). Carbon emission from global hydroelectric reservoirs revisited. Environment Science Pollution, 13636-13641. Teodoru, C. R., Bastien, J., Bonneville, M.-C., del Giorgio, P. A., Demarty, M., Garneau, M., . . . Tremblay, A. (2012). The net carbon footprint of a newly created boreal hydroelectric reservoir. Global Biogeochemical Cycles, 1-14.